This is the Christmas window display in the Apple store on Regent Street, where I spent much too long drooling over £300 headphones last night. Boy they’re good. Coldplay was on in the store, so I stuck on a pair of Bose Quiet Comfort 3s, turned on noise reduction and bam… no more background drivel. I’m afraid I don’t really get the tree-on-a-stick. 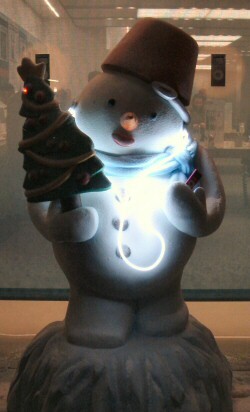 Maybe having just a snowman isn’t enough to say "It’s Christmas, buy more stuff". And isn’t that Tommy Cooper’s hat? Bose noise reducers are best in their class.. as endorsed by Hellmuth!